Hi, I am interested in your 1949 Mercury Series 9CM (stock #19GKM48) listed on Autotrader for $29,900. I'd like to get more information about this vehicle and confirm its availability. Beautiful Merc, Ready for the Drive-in - Ford Flathead V8/3 Speed Manual - A few tasteful modifications for a Lead Sled look - Same owners for the last 43 years - (Please note: If you happen to be viewing this vehicle on a website other than our main website, its possible that only some of our many photographs of this car are presented due to website limitations. To be sure you access all the photographs, please go to our main website: Garage Kept Motors.) 1949 Mercury Series 9CM 2-Door Coupe - Unleaded Merc Garage Kept Motors is pleased to offer this sleek Mercury Coupe, that has owned by the current owners since 1976. 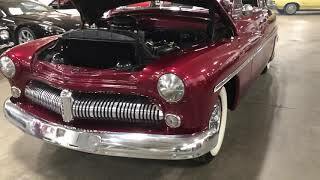 Some striking features include Maroon Metallic paint, white walls, chrome grille, fender skirts, a Ford Flathead V8.....all thats missing is a malt and a 10-cent hamburger. This Mercury is from the era when cars were really cars, with loads of character and charm. The car is finished in a custom Dark Candy Red-like metallic paint. The interior features matching upholstery on the seats, headliner, and door panels. Take a seat behind the wheel and youll find a 3-on-the-tree manual shifter, clear factory gauges, push-button radio, and some chrome trim. A few tasteful small parts added to both the exterior and interior of the car give a hint of custom lead sled or hot rod styling, while keeping the flowing factory lines of this special Mercury Coupe. No channeling, chopping, or lead added on this one! Rust-free and ready for a new garage to call home. This Mercury has been with the same owners for the past 43 years who have taken great care of the car. The car is all original other than the custom paint and interior. Both those areas were updated in 1983. The Ford Flathead V8 was rebuilt in 1967 and still fires up on command. Brake shoes, wheel cylinders, radiator, master cylinder were replaced recently. This coupe is a great car to drive and gets attention wherever it goes. The three-speed manual transmission shifts easily through the gears, and the engine hums right along. Roll up your sleeves, slick your hair back, hop in this Merc, and take a cruise to the diner! This car comes to us out of very nice collection of classic vehicles. Be sure to check other comps and you will find this Mercury is a bargain at the price offered here. A fantastic 40s Mercury at a very reasonable price point. Be sure to check out all the photos and video on our main website: Garage Kept Motors. Call if interested or e-mail with any questions. Thank you for looking.